Oscar Wilde, although most commonly known as a playright, was also a critic. 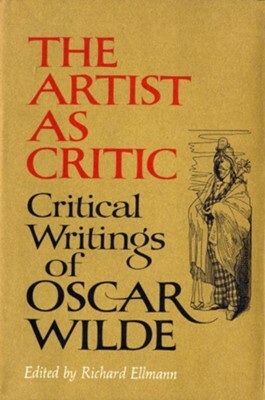 The Artist as Critic is a wide selection of Wilde's book reviews as well as famous longer works such as "The Portrait of Mr. W.H.," "The Soul Man under Socialism," and the four essays which make up Intentions. Richard Ellmann, during a long and distinguished career, won international recognition as a scholar, teacher of English literature, critic, and biographer. His magisterial life of James Joyce has been widely acclaimed as the greatest literary biography of the century. Ellmann was born in Highland Park, Michigan, in 1918. He studied at Yale and at Trinity College in Dublin. He taught at Harvard, Yale, Northwestern, Emory, the University of Chicago, Indiana University, and Oxford, where he was Goldsmiths' Professor of English Literature and Fellow of New College. His James Joyce (National Book Award, 1959) was preceded by Yeats: The Man and the Masks and The Identity of Yeats, and was followed byamong other greatly praised bookstwo volumes of Joyce letters, Eminent Domain, and Four Dubliners. Ellmann died in May 1987, in Oxford, soon after completing Oscar Wilde, to which he had devoted some two decades of study, research, and writing. Oscar Wilde (18541900) was an Irish writer, poet, and playwright. His novel, The Picture of Dorian Gray, brought him lasting recognition, and he became one of the most successful playwrights of the late Victorian era with a series of witty social satires, including his masterpiece, The Importance of Being Earnest. I'm the author/artist and I want to review The Artist As Critic: Critical Writings of Oscar Wilde - eBook.